Other mistake: When Chester is taking Jacko's pipe, Nelson gets up out of his seat. When they show Jacko really really mad, you can look in the background and Nelson is sitting down. When they show him again he is out of his seat. More mistakes in Dude, Where's My Car? Mr. Pizzacoli: A trained dolphin could deliver pizzas better than you two! Jesse: But then the pizzas would get all wet. Chester: Is that a barn? Jesse: Then it isn't a barn! 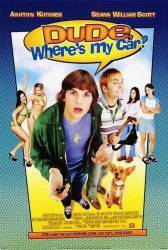 More quotes from Dude, Where's My Car?